The media player application allows you to play digital audio and video files that are stored on the network drive directly in the web interface. Simply double-click the files in the file explorer and the media player opens automatically to start playback. The media player (flash player) supports following file formats natively: *.mp3, *.flv and *.swf. For other file formats, media playback is handled by the available plug-ins of the web browser (e.g. Quicktime for *.mov videos). Refresh Refresh the content window. Show Player Show or hide the player screen. You can also double-click on a media file to open the player screen. Previous Go to previous file in the list. This button is not available if you have only selected a single file for playback. Play Play the selected file or if no files are selected in the track list, start playback at the beginning of the current playlist. Next Go to the next file in the list. This button is not available if you have only selected a single file for playback. Add List Add a new playlist. Rename List Rename the selected playlist. Delete List Delete the selected playlist. Add Items Add new items to selected playlist. Copy Copy the selected file(s) to the clipboard. Cut Move the selected files(s). Paste Paste the file(s) from the clipboard or move the files to the selected playlist. Delete Delete the selected files(s). In the panel on the left side, you can access your custom playlists. The playlist Recent is created by default and shows all the files that were recently played in the media player. Enter a name for the new playlist and click OK. The new playlist is now available under PLAYLISTS. Change the name and click OK to save it. Select the playlist where you would like to add the new files. 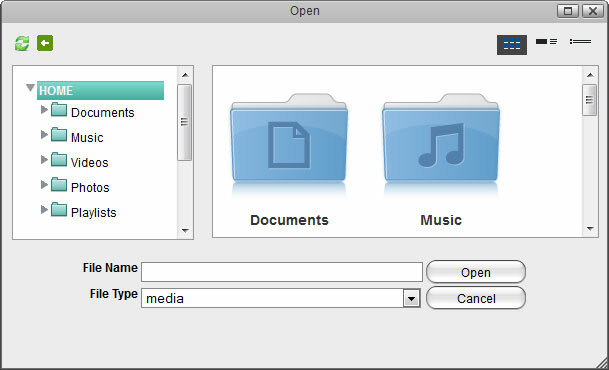 Locate the folder where your media files are stored. Control (Ctrl) or shift (Shift) click to select the files that you would like to add to the playlist and then click Open. The files are now added to your custom playlist. In the main window you can view and manage the files in your playlists. Use the buttons in the toolbar or the context menu to edit the files. Double-click on any item to start playback or make sure no files are selected and then click Play to start playing the whole playlist. Name Shows the name of the file. Location Shows the path where the file is stored on the network drive. Duration Shows the playback time of the file. Artist Shows the name of the artist. Album Shows the name of the album which the file belongs to. Comments Shows additional comments about the files. Control (Ctrl) click: Press and hold the control key to select multiple files in random order. Shift (Shift) click: Select the first file in a sequence, press and hold the shift key and then click on then the last item to select a range of files in order. Select All: Right-click to open the context menu and use the select all command to select all files in the current playlist. 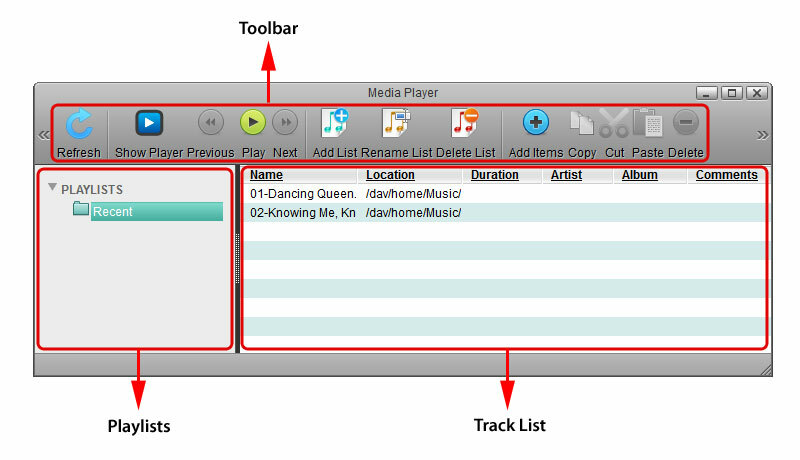 To edit the files in the playlist, you can also use the context menu by right-clicking on a file in the track list. Select All Select all files in the current playlist. Select None Deselect all files. Play Play the selected file.